The Foreign and Commonwealth Office (FCO) released its third Human Rights report on the 31st of March for the year 2011. The report improves its coverage of LGBT issues over the two consecutive ones, especially in relation to the Middle East and North Africa (MENA). The FCO is asking NGOs, organisations and individuals to get more involved in order to "help inform our work". Dan Littauer, the executive director of Gay Middle East, noticed that only some countries in MENA were covered in the report: Iran, Iraq, North Sudan, Saudi Arabia, Somalia, Syria, Yemen, and North Sudan. With respect to LGBT rights, the reports on Iran, Saudi Arabia and Syria were relatively wide ranging. Furthermore, he noted that LGBT rights were not discussed in Iraq, North Sudan Somalia and Yemen. In these countries LGBT people face serious discrimination and persecution, including the death penalty in North Sudan and Yemen. Many other countries in MENA were not discussed at all. Dan entered in contact with the FCO and enquired about these issues. An FCO official replied as follows:. “The report’s webpages ( www.fco.gov.uk/hrdreport ) include the 2010 report and we will also publish updates online every three months on human rights violations and UK actions, including on LGBT matters, in each of the featured countries of concern." 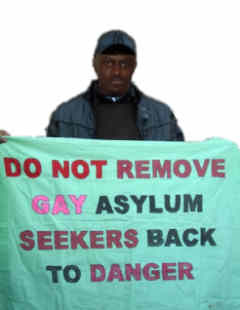 He also called upon individuals, activists and NGO’s to get involved – he can be contacted on contact@gaymiddleeast.com . In addition the FCO has announced that people can submit questions to the Foreign Office Minister Jeremy Browne about the report.